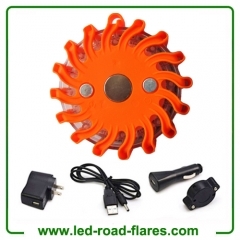 We are China Rechargeable led road flares factory, Supplier and Manufacturer,offering different standard rechargeable led road flares including led road flares uk,led road flares australia,led road flares canda,led road flares south africa. This Rechargeable Led Road Flares features 9 different lighting modes for muti-purpose emergency signalwarnings, including identifing road hazards, signal for help, mark detours, underwater scuba or repair applications,emergency use,camping,outdoors,road flares,marine applications and Ideal for emergency responders, survival kits or personal highway car packs, truckers, maritime industry workers, aviation industry workers. Led Road Flares can be used rescue beacon and as a warning light in case of flat tires, engine trouble, dead batteries, car breakdown or driving at snowy, foggy, rainy days and other bad weather. It is mostly used in law enforcement officials, fire departments, hospitals and military, lane closures, traffic control, crowd control, DUI checkponits and fire training, police, firefighters, EMT's, rescue first responders, members of emergency response teams and everyday civilians.LED Road Flare can handle extreme temperatures & underwater, can be used in HAZMAT situations (intrinsically safe). Push the Power button once for each lighting pattern.Press and hold the power button for 3-4 seconds to power off it. Untilnow, car drivers and owners have found large numbers of uses for emergencylights, flares and flashlights installed in their vehicles. Especially,experienced people associated with automotive sector recommend for the usage of LED light source, flashlight and other sources in their cars, as LED productspossess relatively long battery life and possess quality bulb light as comparedto any traditional product available in the market.